You'll be £15.99 closer to your next £10.00 credit when you purchase Beyond Rome to the Alps. What's this? Rome was liberated on 5 June 1944 but the Italian campaign had another eleven gruelling months to run. The US Fifth and British Eighth Armies drove across the Arno River, capturing Florence on 5 August. Once again The Wehrmacht’s Tenth and Fourteenth Armies eluded destruction, withdrawing into the Gothic Line in the Northern Apennines. The Eighth Army, advancing along the Adriatic coast and the Fifth Army in the mountains north of Florence penetrated this strong German defensive belt between 25 August and the end of September. Yet the Allied campaign stalled due to a lethal combination of supply and manpower shortages, the early onset of winter and the rugged terrain favouring the German defenders. The Allied April spring offensive saw Eighth Army breakthrough the Argenta Gap into the Po Valley, while Fifth Army captured Bologna.. After crossing the Po River the Allies fanned out across Northern Italy, before the Nazi surrender on 3 May 1945. These dramatic events are described in words and images in this superb Images of War book. One of the latest in the excellent Images of War series many of which have been authored in the US by Jon Diamond who is a keen student of WW2 and collector of original photographs. 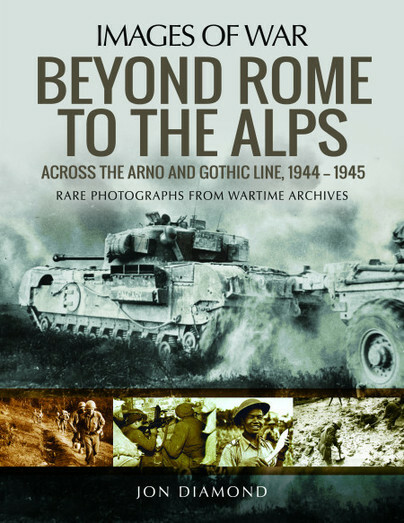 The title covers the complex and often overlooked campaign which saw the Allies advance from Rome to achieve final victory in Italy. As such the author has set himself a formidable challenge but although the text is necessarily complex the extremely clear annotated maps are excellent and help the reader to understand the complexities of the campaign. The superb, and in many cases, very graphic, gritty black and white front line photographs from the UA Army Military History Institute (USAMHI) at the US Army War College and the Still Photograph Section of the National Archives and Records Administration (NARA) in College Park, Maryland will be new to the most British readers. I found this another good book in the Images of War series from author Jon Diamond and one that does well to help remember those troops who fought and in many cases died as the war was in it's final stages.